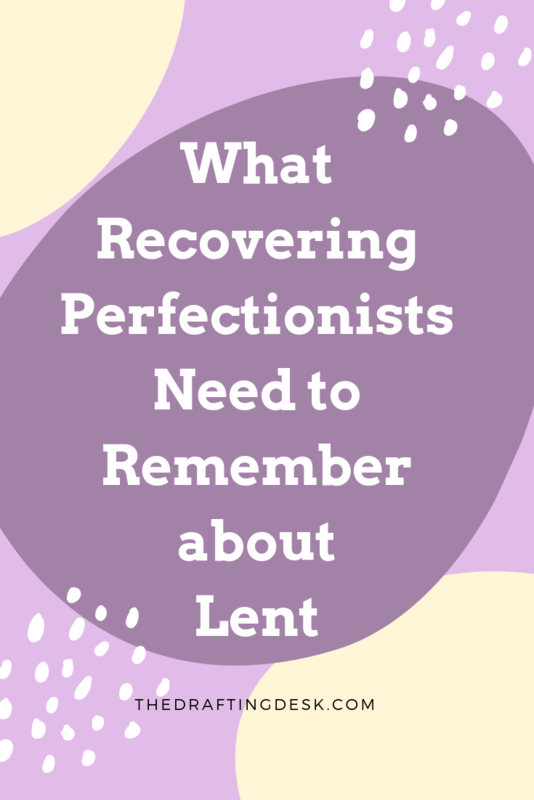 Lent for Recovering Perfectionists: What Do You Want Most? It’s that time of year: runny noses, gallons of hand sanitizer, my bathroom wastebasket overflowing with tissues. The humidifier is running in my baby’s room each night, and I occasionally do a quick run through the entire house wielding a can of Lysol spray. I know I’m not the only one. I see you bemoaning your sneezing coworker, lamenting the flu vaccine that did no good for your family, and filling up your shopping cart with a lifetime supply of cough drops. Solidarity, winter warriors. Last winter, our whole family experienced one of those terrible viruses that arrived swiftly and worked its way through every family member, one after the other. When our oldest, Ian, was in the midst of it, he was on a constant rotation of Tylenol and Motrin. By the end of this particular virus, he had quite enough. Evan and I did the routine all parents of toddlers have done: one of us pinned his arms while the other tried to force him to swallow the medicine. That’s a sentiment I relate to more than I’d like to admit. When my Monday starts poorly or my Saturday is disappointing, I start making a string of bad choices. I choose a cup of coffee and a treat instead of a good meal, I scroll social media instead a truly refreshing activity, I mope and pout instead of expressing my thoughts. I could attempt to turn things around (or at least make myself feel better about the situation), but instead, I atrophy. I’d rather let the fever run its course than choke down the medicine. Why do I do this? Maybe it’s laziness or immaturity or entitlement. Maybe it’s all three. I think, “I am having a bad day. Life is hard. I deserve a treat. I deserve a break.” But each poor choice means I haven’t nourished my mind, soul, or body. I continue being grumpy and sluggish. At the end of the day, I am disappointed with how things went. This mindset is particularly tempting at this time of year, a couple weeks into the Lenten season. We may be disappointed with our inability to remember the prayers we wanted to incorporate into our days, our the lack of willpower we have to stick to the fast we had planned, or our lack of attention to issues of injustice and poverty this seasons asks us to consider. Of course, sometimes a cookie is just fine. (I have a truly impressive sweet tooth.) I do not begrudge anyone a grumpy day now and again. But for the most part, this pattern doesn’t help me walk in freedom. Instead, I am a slave to my most unhelpful thoughts. Maybe in the midst of these bad moments or bad days, I could stop to ask myself, “What is going to bring me more lasting joy? The Netflix binge and pint of ice cream, or wrapping up the novel I’ve been puttering through? Loud sighs and cold shoulders or a quick moment to jot down a prayer?" Lent is a good time to consider these questions. Traditionally, the Lenten season is one of fasting. Some people fast from food, but overall, it is a time of intentionally choosing to remove one thing from our lives to make more room for Jesus. (Last year around this time, back in Issue 006, I shared about fasting from Facebook.) When you’re tempted to grab a cookie from the pantry, you can instead stop and say a prayer. When you would normally turn on a podcast, you can turn on worship music instead. When you would normally complain, you instead jot down one thing you’re grateful for. Still, I don’t want Lent to be merely an exercise in self-discipline and restraint. I want Lent to be an encounter with Jesus. Several times in Scripture, Jesus asks someone, “What do you want me to do for you?” He could have looked at them, diagnosed them, made them better. But Jesus looks at us with holy curiosity, and we get to participate in our own transformation. If we are choosing to fast during this Lenten season, no doubt, this is the question we'll face: What do we want most? We are practicing acts of both patience and intention: bypassing those lesser, initial desires—Facebook or chocolate or online shopping or complaining—and replacing them with what truly satisfies: Jesus. If left to her own devices, the perfectionist in me would declare every day a failure. The smallest sign of disappointment, distraction, or disarray is all it takes. This realization, though, is helping me learn to put away my scorecard and stop assuming I’m too far behind for a comeback. Perfectionism says my day can’t be recovered; freedom says otherwise. Because at the end of a long day, I just want to feel better. A version of this post originally appeared in the February 2018 issue of The Drafting Desk. If you want to receive reflections like this in your inbox on the 20th of each month, subscribe here! We’re so easily distracted by sparkly lights, potlucks upon potlucks, Elf on the Shelf shenanigans, mailing cards to arrive on time for Christmas, and navigating family drama. Add to that the weight of what’s happening in the world today, and distracted turns into downright overwhelmed. The longer we scroll, the more focused we become on the flaws in our decorations, our lame gift-wrapping skills, our Christmas cookies that didn't turn out quite like they were supposed to. If our eyes are fixed anywhere other than Bethlehem, we are missing the only thing that actually matters. I’m looking at my soul and realizing that the crows and locusts of perfectionism have had their way with me. I look at the devastation, and I am angry. It’s becoming clearer to me the depth to which this perfectionism has gotten its insidious claws into every part of me, and I’m so mad. Nothing reminds me of how not in control I am, how miserably human I am, like getting sick. Jesus has already extended grace to us; all we can do is accept it.